Why not have a go at the Christmas Quiz below with a chance to win a wonderful tin of chocolates and raise money for Save the Children?! 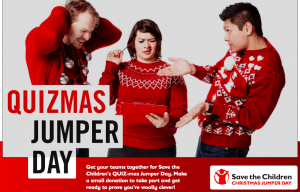 *Text TEAM23CCC to 70050 to donate £2 to Save the Children’s Christmas Jumper Day. Give it your best shot and send your answers to Carol by email, or drop the print off back to Carol, or the office, before Friday 14th December, when we will announce the winner! Winners will be drawn at random from the most answered correctly! Be sure to write your name and email address / preferred contact number on any paper entries!